Late last month, we joined neighbors in West Seattle’s Sunrise Heights and Westwood neighborhoods to celebrate the completion of the Barton Combined Sewer Overflow Control (CSO) Project, WTD’s first large-scale green infrastructure project. 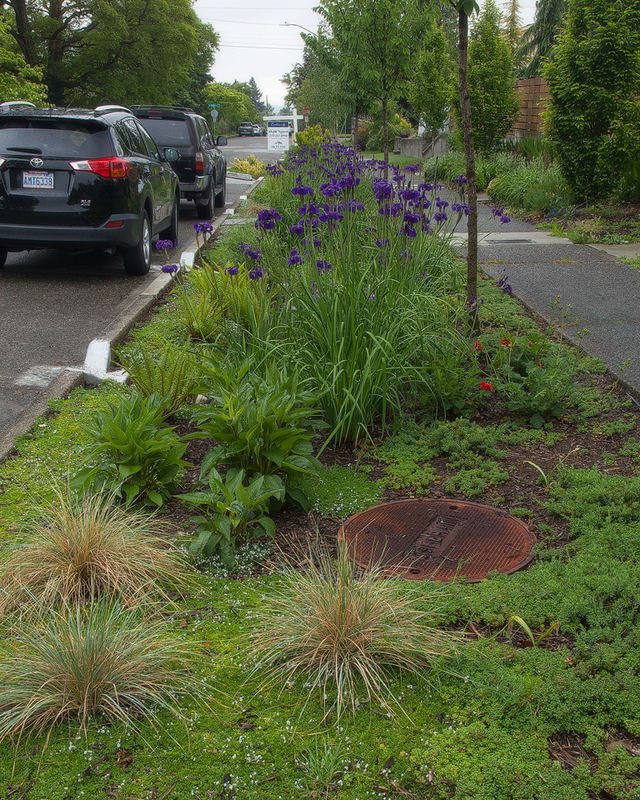 More than just beautiful, these roadside rain gardens will help control a significant source of pollution into Puget Sound. WTD built a total of 91 roadside rain gardens over 15 streets that will keep excess stormwater runoff out of the sewer system and control overflows into Puget Sound near the Fauntleroy ferry dock during heavy rains. These overflows are often referred to as combined sewer overflows, or CSOs. At the community’s request, we are also making rain gardens and cisterns available through the RainWise Program, which offers generous rebates to eligible home owners to control stormwater runoff on their own property. So far, 83 neighbors have signed up to participate in RainWise, which will keep an average of 4,000 gallons of stormwater runoff a day out of the sewer system. WTD greatly appreciates the feedback and ideas we received from the neighbors throughout the Barton CSO project planning, design and construction, which helped us address concerns and deliver a project that reflects community values. Visit RainWise Program contractors at the Seattle Tilth Harvest Fair, Saturday, Sept. 12.